Garvey | Simon Art Access, LLC is pleased to present an exhibition of new oil pastel drawings by Daisy Craddock in its Indianapolis location, 27 East Main St, Carmel, IN 46032. The exhibition runs from January 13 – February 26, 2011. Daisy Craddock was born in 1949 in Memphis, Tennessee and received her MFA from the University of Georgia in 1973. She has been exhibiting her work nationally since the mid-1970s. 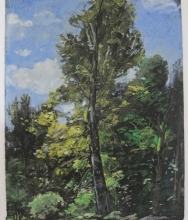 Known for her gestural paintings and drawings that explore nature, Craddock’s new body of plein air drawings are the subject of this exhibition. Built up in rich layers of color, the artist has traditionally worked on a darkened paper or canvas since 1979, the year her mother died and her daughter was born. These new works have jettisoned the dark ground, the first time the artist has done a body of work on white since the late 70s. Craddock states: A return to white feels loaded with promise and fresh meaning. I used to say that working over black was a way to make something out of nothing. By contrast, the new drawings celebrate a joy of living in the here and now. Regardless of the ground, my drawings have always been a place where a vocabulary of line, gesture and color is worked out. Most of the works in this exhibition were created while Craddock was renting a 19th century farmhouse in the Berkshire Mountains last summer. Her studio was a renovated goat shed, and the surrounding fields, barn and lake were the inspiration for these exquisite drawings. Small in scale, they range from 10 inches square to 10 by 14 inches. The intimate size of these small drawings brings the viewer in close to experience their texture, hue, and line. Despite their small size, there is a certain intensity and energy in these works that belie their scale and peaceful subjects. These plein air compositions (worked on site) serve as a journal of sorts. They act as an immediate recording of the artist’s experience of time and place, a feeling she hopes to share with viewers of her work. 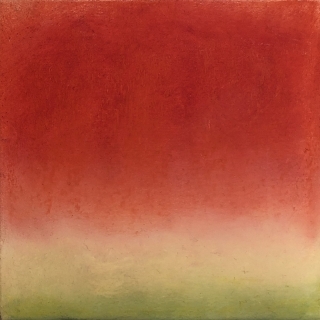 Daisy Craddock’s work has been exhibited widely throughout the United States. Recent one-person shows include the Fischbach Gallery in New York City, November 2009, and David Lusk Gallery in Memphis in January 2010. Her work has been reviewed in Art in America, The New York Times, Art & Antiques, American Artist, Art News, and Arts Magazine. Public collections include the Anderson Museum, the Newark Museum, the Memphis Brooks Museum of Art, the Milwaukee Museum of Art, the Roswell Museum, the Rubin Museum of Art, and the Weatherspoon Museum. She is the recipient of a Roswell Artist in Residency and a 2002 New York Foundation for the Arts, New York Arts Recovery Grant. The artist lives and works in New York City.